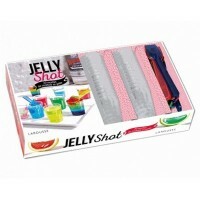 Get the party started with this jello shot recipe book and gift box, just what you need to throw an American-style soirée! With 20 fun and flavorful jello shot recipes that will dazzle your guests, including the Jello Rainbow, the Crocodile Dundee, mojito cubes, and the patriotic shot, this gift set also comes equipped with 32 jelly shot cups and 16 colorful mini spoons. All you need to do now is browse our extensive collection of powdered Jello mixes for a gift that will wow your Francophone friends! Please note: Jell-o packets not included. ISBN : 9782035894359 in French - 46 pages - Publication date: October 2016. Sold at a fixed price set by the publisher.